President Muhammadu Buhari last night received the captured flag of Boko Haram terrorists from the Sambisa forest from the Theatre Commander, Operation Lafiya Dole, Maj. -Gen. Lucky Irabor of the Nigerian Armyâ€Ž. The President also charged the Nigerian Army to ensure that the country remained one and strong indivisible entity despite threats of secession in some quarters. Buhari spoke at the 2016 Regimental Dinner organized by the Presidential Brigades of Guards in Abuja. The dinner was an annual event to mark the end of drilling year. Speaking at the event, President Buhari who went down memory lane, remembered his ordeal which he said would have cost his life. But despite the development, the president said he had a good time, serving the army for 25 years. 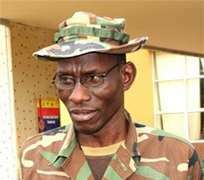 He charged the military to ensure the unity of the country, saying it was sacrosanct. He said: 'I believe you are here because you want to be here and you cannot complain. We will do our best to build the national institutions in the country. 'All these political madness in the country where in the north east, the Niger Delta or in the East. Speaking on the state of the economy, president Buhari recalled his position on the devaluation of the Naira, hike of the petroleum products among others. According to him, he rejected similar advice by the IMF, World Bank to devalue the Naira as a military Head of State. 'I refused and gave my reasons and the next thing I knew I was removed and detained for three and half years. 'As a civilian president I will do my best and I'm telling you all these because you are part of the leadership of this great country and God willing we will remain great', he said. Also speaking, the Chief of Army Staff. Gen.Tukur Buratai said underscored the function of the brigade of guards, saying that apart from providing security to the president, they also provided security for the FCT. He also reminded the officers to need to maintain discipline at all times even in 2017, promising not to give up in the north east until the insurgents were completely wiped out. Buratai also promised to restore calm in other troubled areas of the country, however assuring that the army would remain apolitical. Handing over the flag to the president earlier, Irabor in whose command the Boko Haram stronghold, 'Camp Zero', in Sambisa forest was eventually captured disclosed that â€Žabout 1,240 suspected Boko Haram terrorists were arrested during a mop-up operation by troops inside the Sambisa forest. The highlight of the event was the â€Žcommissioning of the PMB Gymnasium at the Scorpion Mess in W.U Bassey Cantonment By President Buhari. Meanwhile, the Defence Headquarters (DHQ), Abuja, has said that the days of Boko Haram leader, Abubakar Shekau, are numbered, calling on his remaining members to surrender to the troops. The Director, Defence Information, Brig.Gen. Rabe Abubakar, in an interview said arrested Boko Haram members were already supplying the military with vital information. Abubakar added that Boko Haram members should not allow Shekau to deceive them any longer, as his days were numbered. He said, 'The Boko Haram insurgents are applying medicine after death. After all, we are aware that such video was done before we took over Sambisa Forest. Therefore, the release of the video is not surprising to us. 'The insurgents are defeated and those arrested are giving us the vital information that will aid our mop-up operations in the area.